In case you haven't noticed, it's November. Whaaaaaaaat? I know, I know. Wasn't it just Memorial Day? But I can't lie... I've already got the itch. The holiday itch! I'm ready for it- the food, the crafts, the gifts, the decorating, the parties, the food... did I mention the food? I'm excited for it all! First up? Thanksgiving. And a very special one over at the Ten June household- it's the first year that David and I will be hosting the family at our house! Big stuff. Last year, we opted out of the traditional holiday celebrations and took a little road trip out west to Seattle, Vancouver, the Oregon coast/Redwood Forest/northern California/wine country and San Francisco. It was a fabulous time, but we're excited to take the traditional route this year. Needless to say, I've been searching, bookmarking, pinning and ripping out pages of magazines in order to gather all kinds of Thanksgiving inspiration. And even though I didn't host Thanksgiving last year, I'm even looking back to my own blog for inspiration! While I was out of town last Thanksgiving, I had five amazing bloggers post on some of their favorite Thanksgiving things. I've been looking back on them and just had to reshare with you guys- their stuff is incredible! 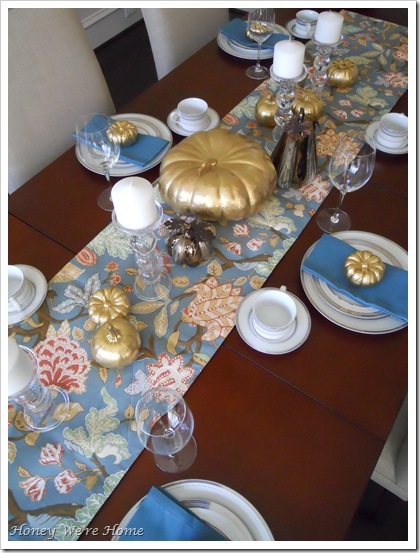 Megan from Honey We're Home created a beautiful Thanksgiving table you can read about here. Courtney from A Thoughtful Place set up an adorable Thanksgiving entryway (and shares a free Thanksgiving printable!) which you can see here. 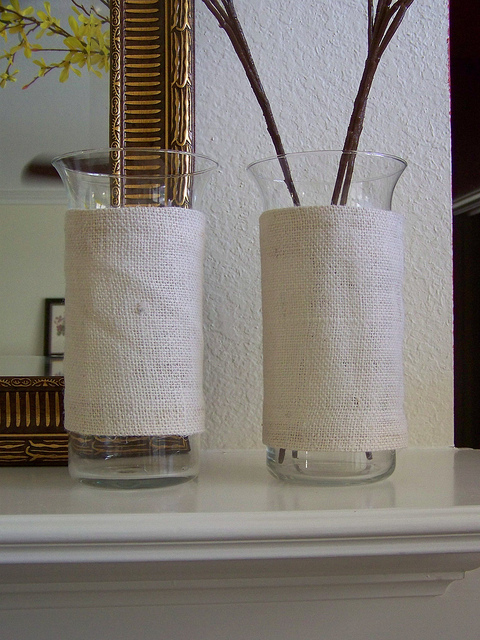 Cassie from Hi Sugarplum crafted some DIY burlap vases similar to the Ballard Design version... but a heck of a lot cheaper! You can read her tutorial here. Ashley from Lemon and Lavender shared some Thanksgiving tablescape inspiration and an amazing recipe for chocolate pumpkin bread (from her grandma!) that you can read here. And my sweet friend Lauren, who no longer has a blog, shared another gorgeous, rustic tablescape that you can learn to create on your own here. 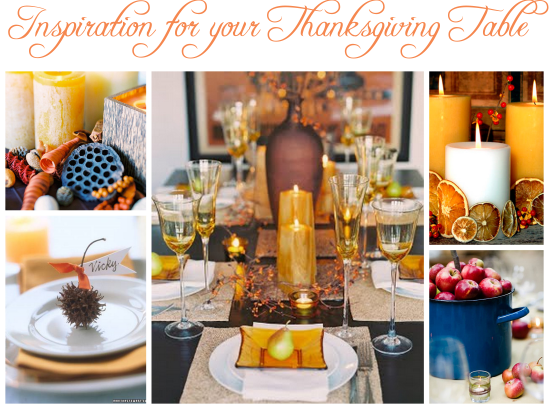 Where are you pulling Thanksgiving inspiration from? my thanksgiving will definitely have a lot of burlap details, i'm loving it this year! I just pulled my inspiration from some fabric I found in my closet! So, I decided on light blue and orange! I posted a bunch of inspiration pics yesterday! Hope you're having a great week! Thanksgiving will be low key for us this year, quiet...just us and the girls. So looking forward to it. Thanks for the shout out! We hosted for the first time ever two years ago and it was so much fun. You will love it. Knowing you, it will be perfect. I'm loving the touch of blue Megan used. Thanks for the inspiration. It will be our first time hosting too. So excited. I already marked about 30 recipes ;) and can't wait for the table decorations!! There will be lots of pumpkins, corn and candles for decoration on the table! thanksgiving is by far my favorite holiday...the food, weather, family..and so much to do i absolutely love it! So sweet of you! I can't believe it's November already! This year went FAST! How fun to get to host this year at your house. I know everyone will feel so welcome and have a blast with you! Great inspirations Michelle!! We are not hosting this year but I have had tons of fun with my Thanksgiving table over the years. I have found that it's really helpful to figure out where you'll be placing food dishes and then set your accessories (flowers and candles, etc.) where they won't be in the way. I hate having to rearrange the whole table when the actual meal is served. Several small decorative elements and votive candles work so well I find! I also love to torture my extended family by making everyone write down what they're thankful for, put in a bowl, mix it up and then have everyone read a random one at dinner :) So much fun to put together a holiday table!